The Henry’s Fork has the chemistry of a spring creek and offers a diverse fishing experience, from Box Canyon to Harriman State Park and onto Mesa Falls. The Henry’s Fork is known for its bruising Rainbows. Affectionately known as “The Fork,” this is one of the most notable and most written about rivers in the world, topping devoted fly fishers' “fish before you die” lists. Named after Andrew Henry, of the Missouri Fur Company, it is a tributary river of the Snake River rising out of Henry’s Lake on the continental divide. Draining the northeast corner of the Snake River Plain, Henry’s Lake is subject to substantial irrigation withdrawals during the summer. Later in the season, this decreases and more water is released, allowing fish to move upstream. 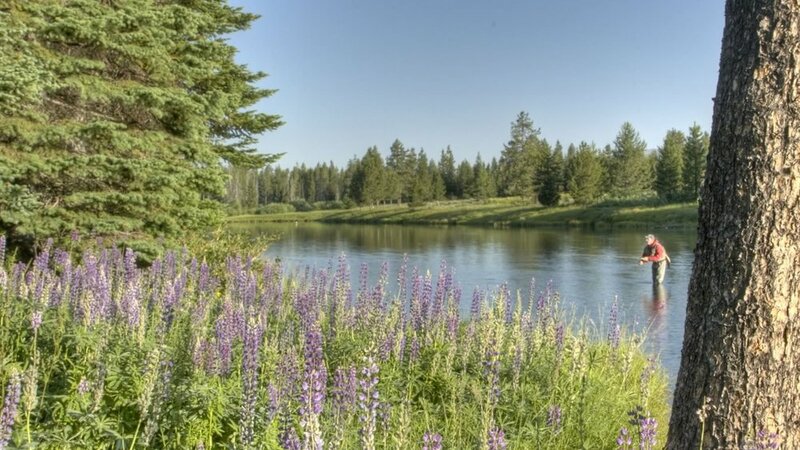 The North Fork of the Snake, better known as the Henry's Fork, is a river not to be missed by any angler. The diversity and quality of water on this river is so great that anglers have been known to dedicate their lives to uncovering all of its watery secrets. Bubbling out of the nutrient rich ground of the Yellowstone Plateau, the Henry’s Fork retains the chemistry of a spring creek throughout its entire length; from Henry’s Lake and Big Springs, to its confluence with the South Fork of the Snake. Three miles of rough and tumble water that is difficult to wade and is not recommended. However, by boat it is a different story altogether, where the angler can ply the deep rocky pockets of the “Box” with large stonefly nymphs looking for that bruiser of a Rainbow that haunts this canyon water. Incredibly scenic and rich in wildlife, it is wise for the angler to look up from their fishing rig every once in awhile and take note of the Osprey diving into the river, the Moose nestled in the bank side pine trees, or the symphony of birds raising voice to the beauty of their home. The Box is a nymph fisherman’s dream come true and the rewards can come often and in large packages! The spring creek type nature of the Fork shines in this long section. Slowing down from its tumultuous pace of the Box directly upstream, the Fork now spreads out across a high mountain plain and meadow, meandering slowly to and fro. Weed beds grow rapidly and are home to more infamous hatches that fill the tomes of fly fishing literature. Sizable Rainbows sip bugs eagerly on the placid surface of this stretch, requiring the angler to bring on their best skills to the “largest spring creek in the world.” Long and fine leaders, delicate presentations, and hatch matching prowess are all prerequisites, but the satisfaction of fooling these legendary trout is monumental. This magnificent stretch is tucked away from major roads and lies in some beautiful and rugged canyon country of the Yellowstone plateau. A short two-mile hike sets the angler in the middle of Lower and Upper Mesa Falls for a fantastic day of fly fishing to eager Rainbows. While this is primarily a nymphing affair, there are times when the spunky trout in this stretch will pounce on large attractors, or are brought to the surface for a good hatch. This wade fishing adventure is a special trip that many wade anglers enjoy every year. As the Fork falls from the Yellowstone high country it leaps towards the Snake River plain of South Eastern Idaho. Warm River and other tributaries add even more nutrients to the river and the fishing remains excellent. Float fishing is a great way to spend the day catching fish while observing the river transition from the high country to the western plains. A mixture of excellent hatches provides excellent dry fly fishing, and the nymphing is always consistent. This is a favorite day for many of our clients and guides alike. Be sure to take a side trip and view Big Springs and the large Trout that are protected at the birthplace of the Henry’s Fork. The diverse variety of water on the Henry’s Fork could take an angler’s entire vacation just to sample all it has to offer.